Can I check my membership payment plan? Yes. If you log-in to the client area, MyEVO, you will be able to see all your monthly payments and respective invoices. During registration, you will be required to enter your credit/debit card details. The card details you submit will be associated with your membership fee and will then be charged automatically through our system. You can check all transactions through MyEVO. What if my card transaction is declined? If this happens, you will receive an SMS text to notify you. First check the expiration date of your card. If this is not the cause of the rejection, contact your card provider or check their website for the following: 1) Does your card have online payments activated? 2) Have you exceeded your card limit or internet transaction quota? Can I use the gym if I'm not a member? Yes. You can get a free one-day trial by registering on our trial page. Right after registration, you will receive an e-mail with a PIN code which you can enter in the keypad at the EVO Club entrance. From the moment on when you submit your registration you have 7 days time to use your one-day trial. What is the minimum length of my contract? At EVO Fitness, we have no contracts. By signing up, the only obligation is the payment of your membership via direct debit. You can cancel the membership monthly, by logging into the client area at through MyEVO, you will be out by the end of the next month. How do I become a member of EVO Fitness? You can become a member of EVO Fitness by registering through the website. On the top right hand corner, you will see a menu link Join Us . If you click on it, it will direct you to the registration form. It has two steps, once completed you have officially joined the club. Will my membership price change? No. Your membership price will remain unchanged as long as you remain our member. Will I receive a member card? No. Instead, you will be issued with a wristband. This wristband must be collected from the EVO club at a specific day/time. Once you collect your wristband, you must activate it. This wristband will be your pass into the gym every time you attend the club. For further details on obtaining your bracelet, please log in to MyEVO. How much is the membership fee? Are there any additional costs? When joining our club, an initial one-time joining fee of 49€ will be charged. From then on, the membership fee is 49€ per month. Sometimes we have special promotions and the price might differ. Yes. Your membership can be frozen for up to 3 months. You can unfreeze your membership at any time. Freezing/unfreezing can be done by logging in to MyEVO. If you freeze your membership, you will only be charged 10€ per month instead of full monthly fee. Can I book a session with a Personal Trainer? Yes. You can contact a Personal Trainer through the client area, MyEVO. He will then call you and book an appointment with you. Are there group classes in the club? The club does not have group classes, because our aim is to provide you with the most space and the best training equipment available on the market. However, there are small group Personal Training sessions. These must be booked directly with the personal trainer and carry an extra cost. Is there a sauna in the club? The club does not have a sauna, because our aim is to provide you with the most space and the best training equipment available on the market. What training equipment can I find at the club? EVO Fitness has state of the art and innovative equipment for cardio, strength and functional training, including leading brands such as Precor, Technogym, Woodway, Concept II, and Tomahawk. I just logged in and I'm not able to visit the club in time to get my bracelett. How can I get access to the gym? What is MyEVO and how can I log in? Once you become a member at EVO Fitness you will be able to log-in into our client area, MyEVO. This will allow you to manage your membership - from updating your contacts and booking personal training, through to managing payments and credit/debit card details. The quickest way to log-in to MyEVO is through the website. On the top right hand corner you will find a menu option - MyEVO. Once you click on it, you will be automatically directed to the MyEVO log-in page. To log-in you must enter the email address and password you provided during registration. I forgot my password. How can I log in MyEVO? Can I use the EVOmove Workouts app if I’m not a member? No, you can’t. Our app is exclusively available only to our active members. I can’t register in the EVOmove Workouts app. To be able to register in the EVOmove Workouts app you must be an EVO member with an active membership. The registration details must be the same as your member details: same email, mobile number (including country code) and primary club. If you’re not sure about your data, log in to MyEVO to find out. What is my password when I register to the EVOmove Workouts app for the first time? When you register to the app for the first time, you define your own password. We recommend selecting a strong password combining alphabet and numbers. How do I change the language of the EVOmove Workouts app? 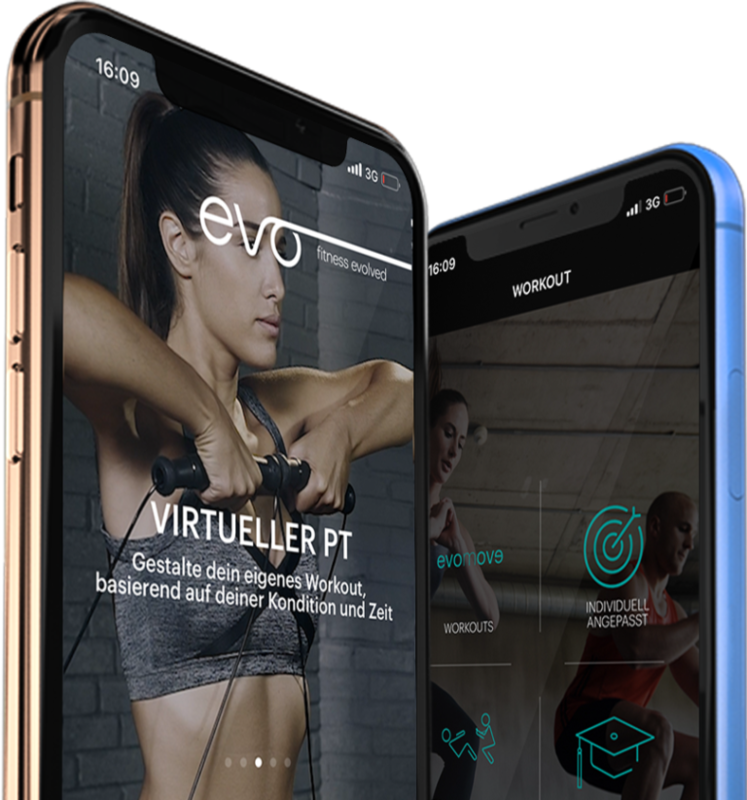 The EVOmove workouts app is currently supporting English, German and French languages. The app adapts to the language settings of your phone. If your phone is set up in German, the app will be in German. If in French, the app will be in French. If your phone is set up in English or any other language, the app will be in English. I cancelled my membership at EVO, can I still use EVOmove Workouts app? I can’t download the EVOmove Workouts app from App Store. Why? The EVOmove Workouts app requires iOS 9.3 or later. If you have an older version of iOS you won’t be able to download the app. I can’t download the EVOmove Workouts app from Google Play. Why? The EVOmove Workouts app requires Android 4.4 or later. If you have older version of Android you won’t be able to download the app.